With Christmas just around the corner, we thought you could use a little last minute inspiration. 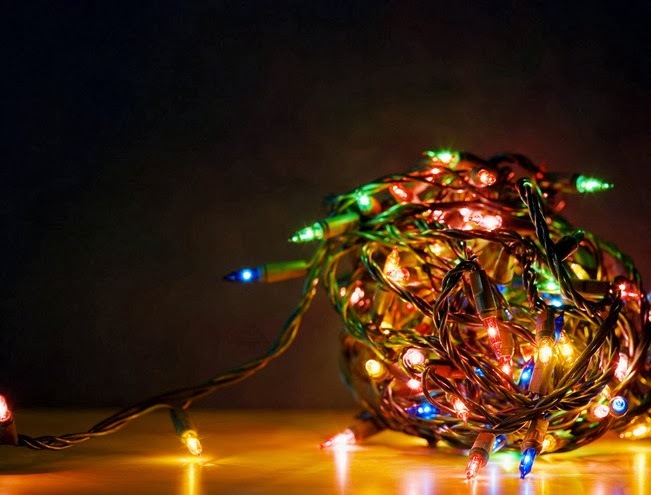 From decorating to entertaining, here are some quick and simple ideas to put the finishing touches on your holiday. If you are on top of things and ready to go, save these ideas for next year! 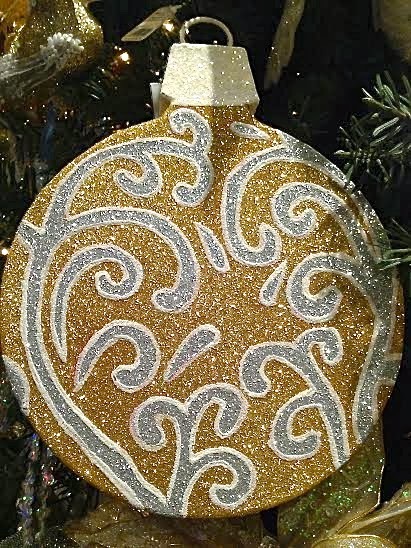 Many of us exchange ornaments or use them to decorate packages. 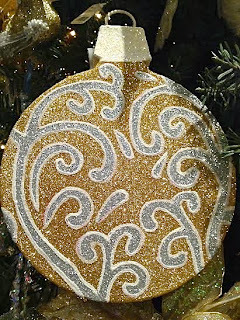 These snowflake ornaments were made by cutting out circle motifs from an old crochet tablecloth. Just dip in fabric stiffener and let dry. Lace tablecloths work well, too; look for them at thrift stores. We are in love with bottle brush trees! How about this Christmas tree farm displayed on a vintage silver tray! Yup, we're obsessed! 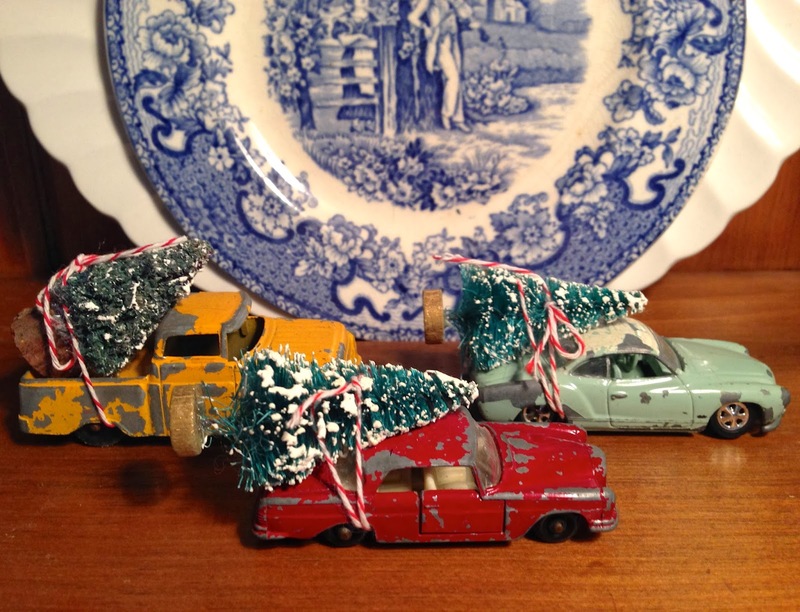 Who can resist a vintage toy car with a bottle brush tree tied to the top? 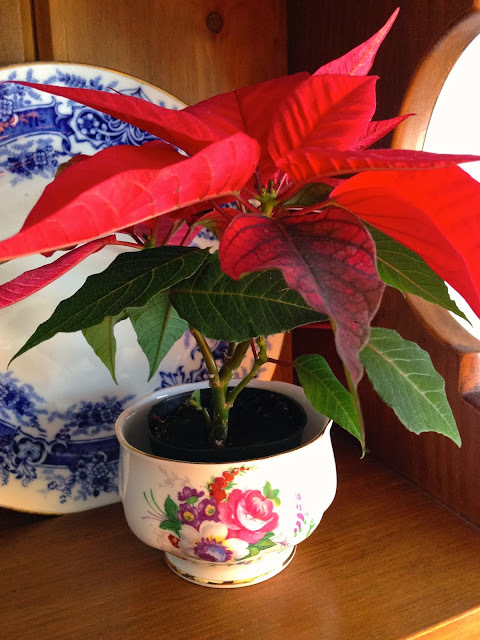 Tuck a mini poinsettia into a sugar bowl for a little holiday cheer. Do you have more people coming for dinner than your tableware can accommodate? No problem, mix and match; it will look modern and interesting at the same time. After all, no one dresses from head to toe in one brand, right? Giving a gift card? Here's a great way to present it. 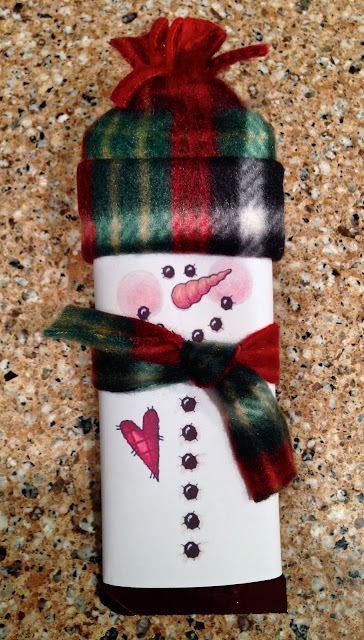 Buy a chocolate bar and wrap it with a printed snowman image. Using bits of fleece, add a hat and scarf. Tuck the gift card under the wrapper and voila! 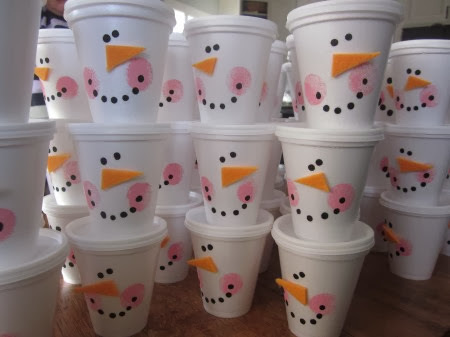 For sipping hot cocoa or filling with candies, we love these snowman cups for the little ones from Blue Cricket Design. All you need are styrofoam cups with lids, orange felt and paint! Friends, we've so enjoyed sharing our vintage finds and every-day inspirations with you this year. From all of us here at Georgia's, we wish you and yours a wonderful holiday and a happy and healthy new year! 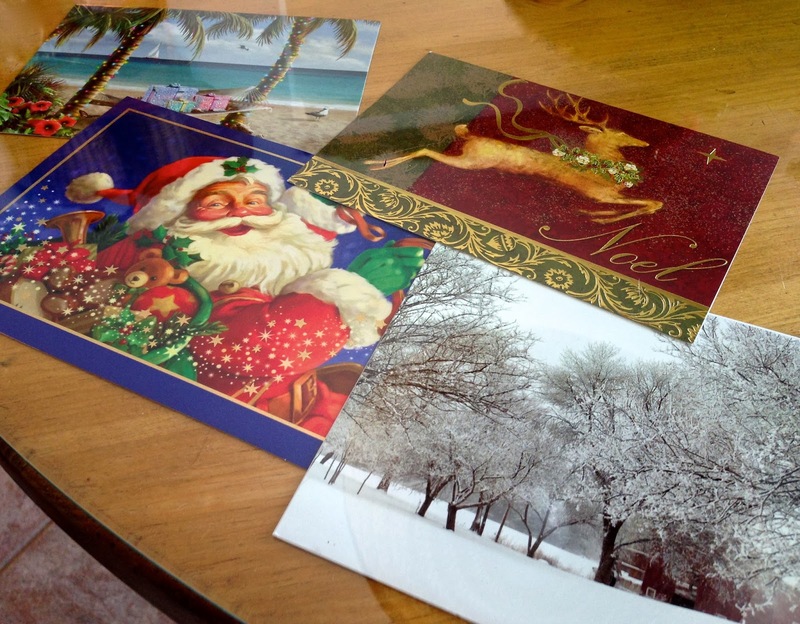 One of my favorite holiday traditions is sending seasonal greeting cards. It's such a nice way to tell people you are thinking about them during this time of year. 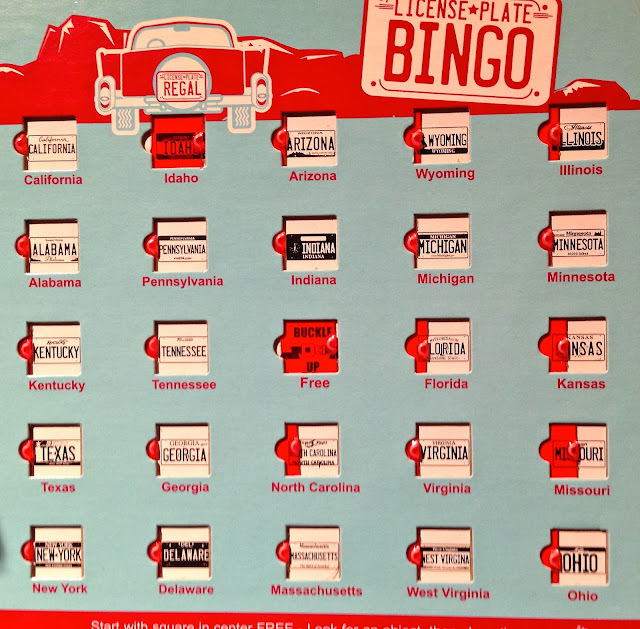 As I am sure you have experienced, displaying these cards can be a trick. 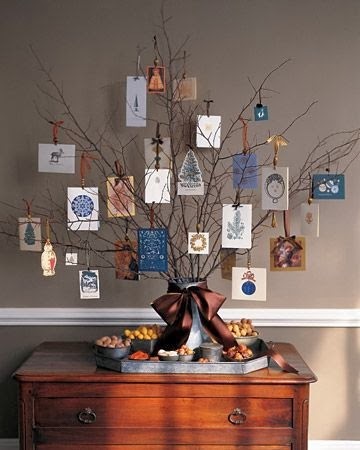 Here are a handful of ideas to help you showcase your cards and add charm to your holiday decor. When you rifle through your Christmas decoration box, do you have any extra ornaments that just don't seem to make it to the tree? 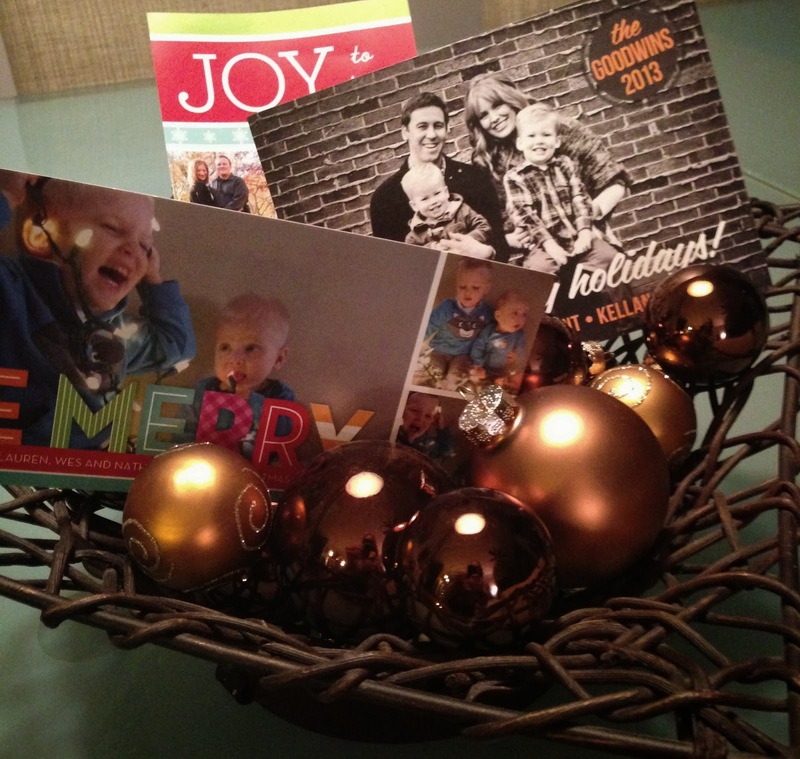 Add them to a decorative bowl and add your cards. The bowl will look great on your coffee table or sideboard. 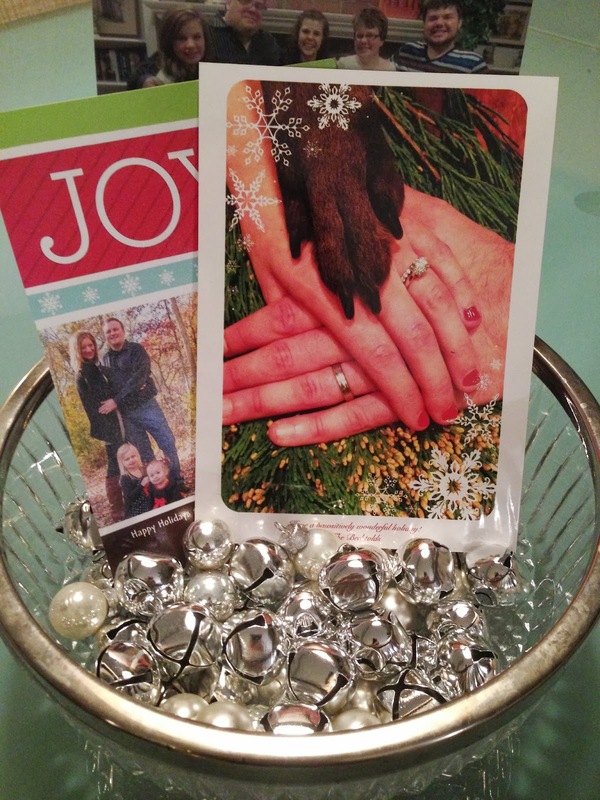 You can use the same philosophy with bells -- add them to a decorative bowl with your cards and voila! Do you have a table with glass on top of it to protect the surface? Slide the cards underneath the glass for a great display. We just love this idea from Martha Stewart! 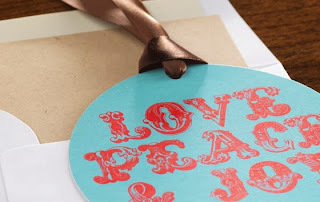 Simply punch a hole through your holiday cards, add a ribbon to form a loop and hang on tree branches. So cute and festive. You can also purchase card holders that can be hung over the back of a door or mounted to a wall. 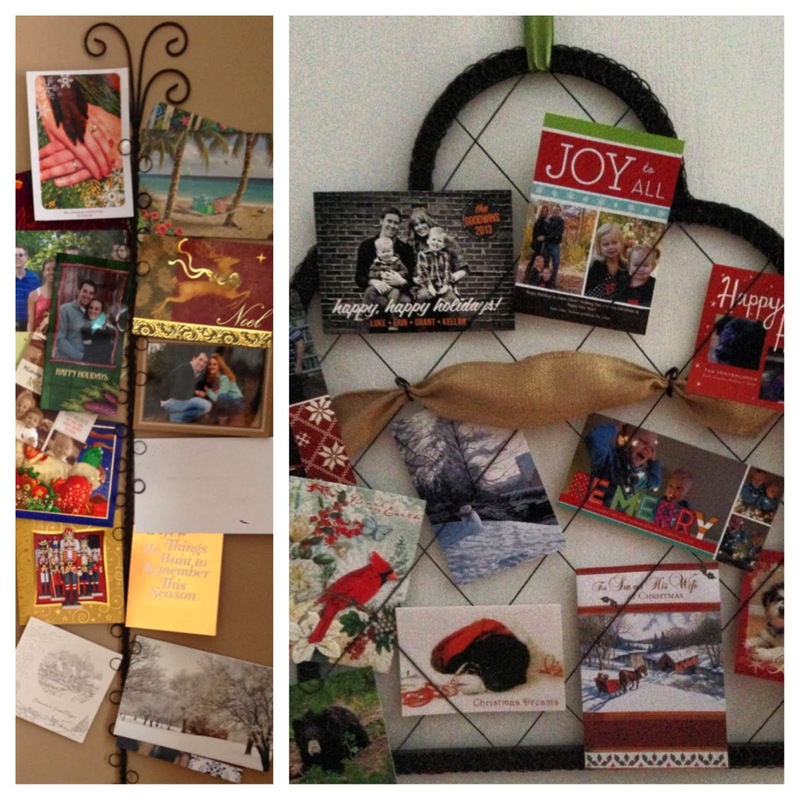 I have a vintage card holder that I hang from a ribbon on my door (image on the right) but we found a great vintage-inspired piece at Pier 1 this year (image on the left)! All We Want for Christmas Is …. We've been out and about gathering inspired holiday gift ideas to share with you. We can't help but marvel at the originality and resourcefulness behind these items! 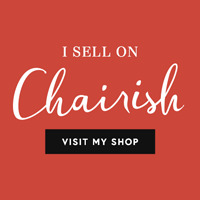 Buying information is provided in case there is something you must have for that special someone. Enjoy! You may have seen vintage door knob wine bottle stoppers, but how about these pool ball stoppers! For more examples, google antique knob bottle stoppers on Etsy. Add a bottle of wine and you have the perfect gift! Everyone is on the road at some point during the holiday. We love this License Plate Bingo game from Restoration Hardware for both young and old! 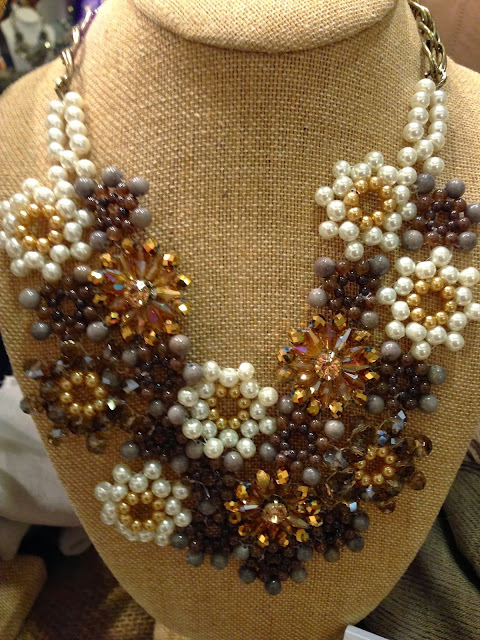 Isn't this beaded statement necklace beautiful! Find them at holiday markets and major retailers. 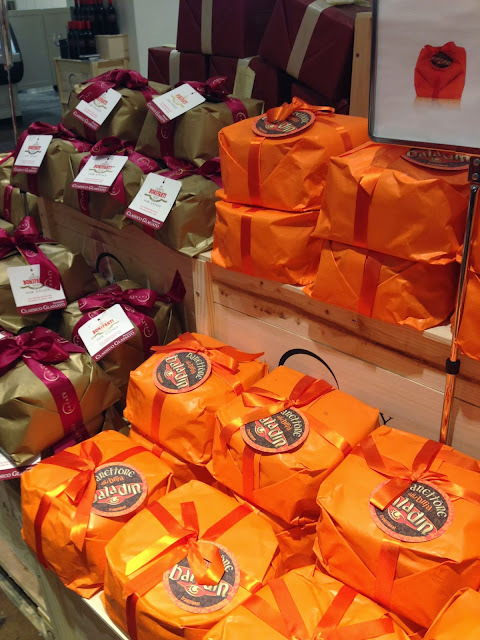 Panettone, a sweet bread loaf studded with fruit originally from Milan, is enjoyed for Christmas and New Years and makes the perfect gift! These beautifully wrapped breads can be ordered from Eataly or found on many gourmet food sites and in fine grocery stores. 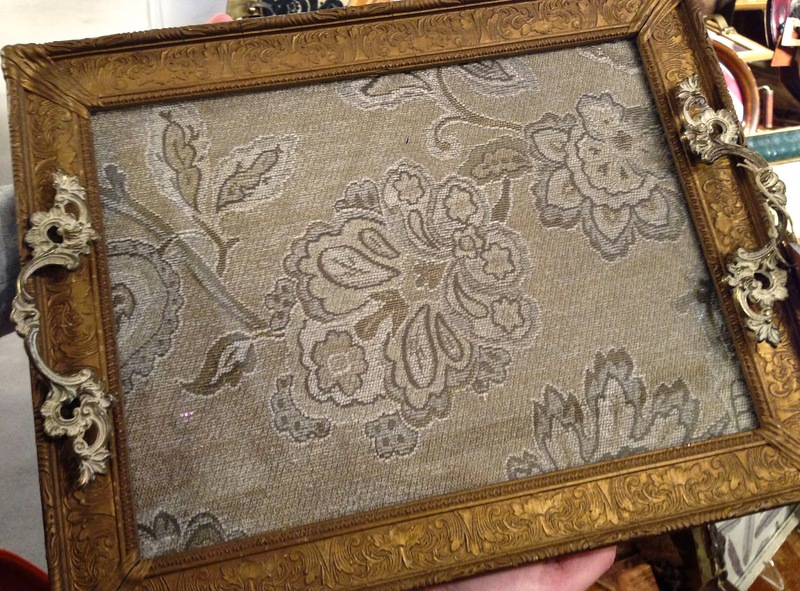 DStressedhome.com makes beautiful trays from vintage frames and drawer pulls. 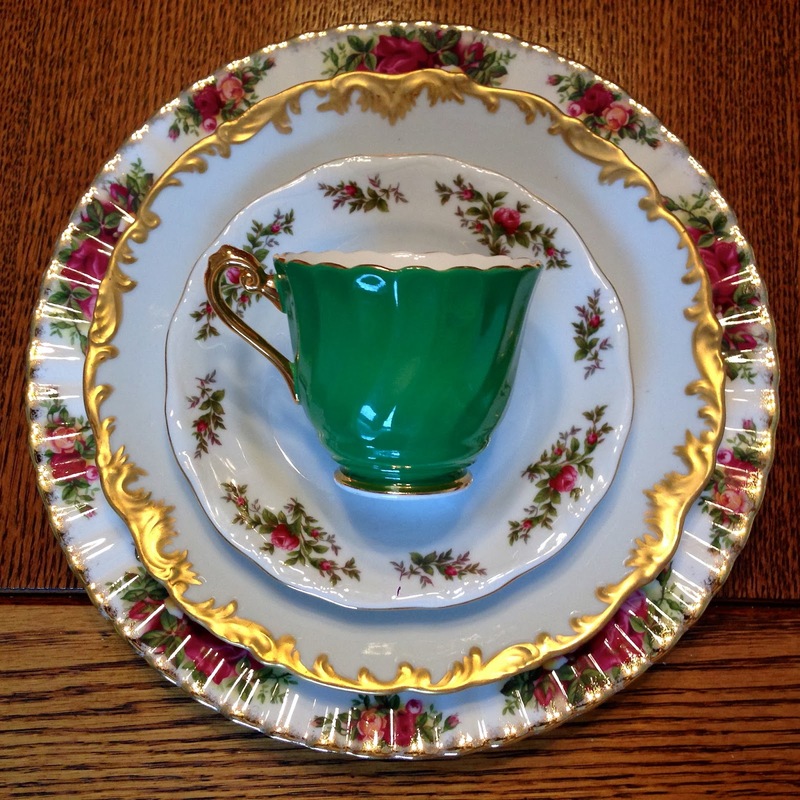 Trays aren't just for serving; use them on a dresser, bathroom vanity or coffee table to showcase special items. Love, love these vintage salt cellars made into ring boxes from The Paper Button. The designer, Kari McDonald, makes the lids from vintage buttons. We would use one on the side of a sink to hold rings while doing dishes or as a tooth fairy box in addition to presenting/packaging a beautiful ring. Here's a great gift for the man in your life: a woolen scarf made from menswear swatches by Margo Petitti. 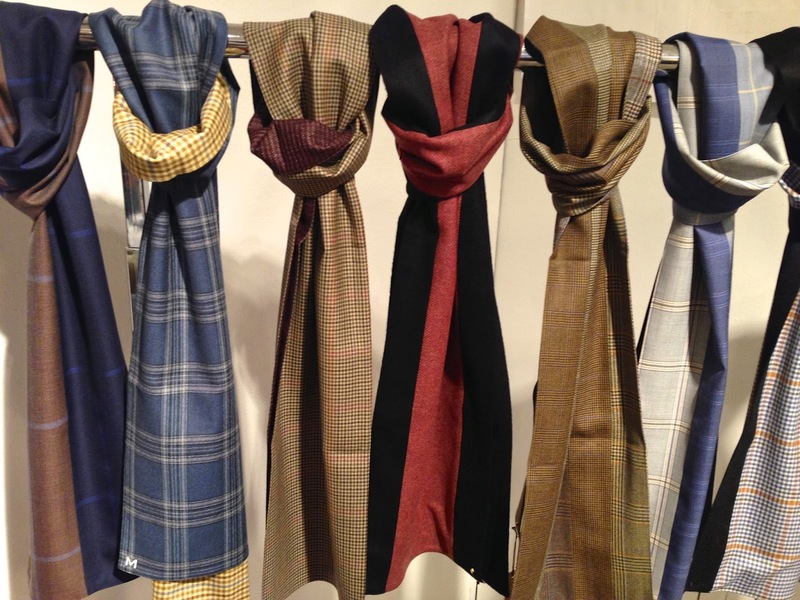 Her line of one-of-a-kind accessories for men are made from fine Italian woolens, silks and cashmere. 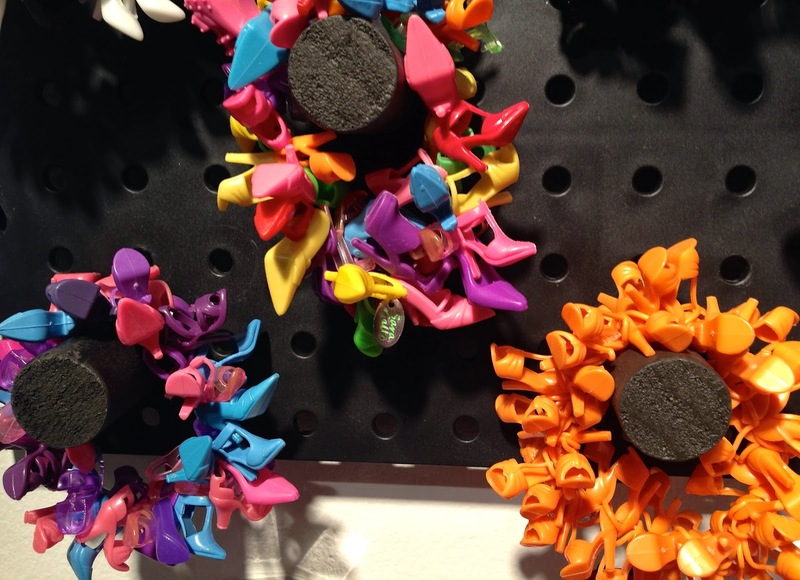 How fun are these Barbie doll shoe bracelets by Sara Gallo Jewelry! Her motto: play dress up! You know you want to! We here at Georgia's hope your holiday shopping is merry and bright! With Thanksgiving behind us, Hanukkah upon us and Christmas and Kwanzaa just around the corner, I wanted to share a few thoughts about the holiday experience. Right about now we are inundated with news reports on the hottest trends, shopping frenzy and sales predictions. 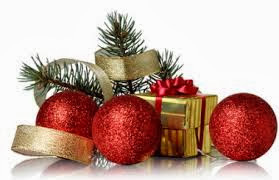 We are told how to get the best deals, beautifully wrap packages, set the perfect table, and pace ourselves in order to juggle it all and remain stress free. The message seems to be that the holiday is something to be survived more than enjoyed. For years I have found this time of year to be very emotional - a mixture of excitement, expectation and even melancholy. When I am out and about, I am deeply affected by the decorations and holiday music; it evokes memories of holiday's gone by and loved ones lost. I want nothing more than to shop and lunch with the girls in my life. Sign me up for the cookie exchange and count me in to go to a holiday craft show. I love every caffeinated minute! So how can we get the most out of the holiday and skirt the downside? Maybe we should start by adjusting our perspective. Gift giving, for example, shouldn't be a chore. It's not about getting someone exactly what they asked for, it's about enjoying the opportunity to give. In our house, there is a long standing rule: you can't ask for your gifts. Now this doesn't mean that hints aren't occasionally dropped, but the shopping experience changes when you have to put a little thought and/or creativity into the gift. Shopping is no longer a laundry list of items to buy and recipients will be appreciative of your efforts. What more precious gift is there than thoughtfulness? Decide to enjoy being among the bustling crowd. Pause to delight in children getting their pictures taken with Santa, hum along with the piped-in music, help someone make a selection, or chat with your neighbor in the checkout line. Choose to be merry and you will be rewarded by way of a joyful heart. Remember, too, that you don't have to "do it all." Pick a few meaningful things to do with loved ones to celebrate the holiday - something everyone will look forward to each year - a cookie baking day, holiday movie night, or piling in the car to marvel at the brightly lit houses. Most importantly, give back. Regardless of your celebration preferences, live out the expression that to those who much is given, much is expected; there are lots of opportunities to volunteer or sponsor others in need at this time of year. Finally, be patient and non-judgmental. Just because we may celebrate the holiday a certain way, doesn't mean others do, too. If we pledge to be generous of heart and spirit, the holiday will be exactly what it is supposed to be - a time of hope, joy, peace and love, especially love.